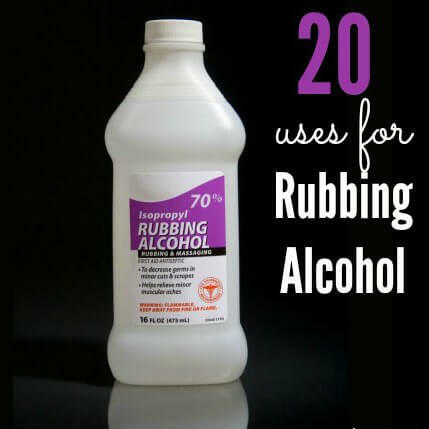 We have compiled a list of 20 rubbing alcohol uses. Some of these you may be familiar with and other may be new. There are so many wonderful uses. 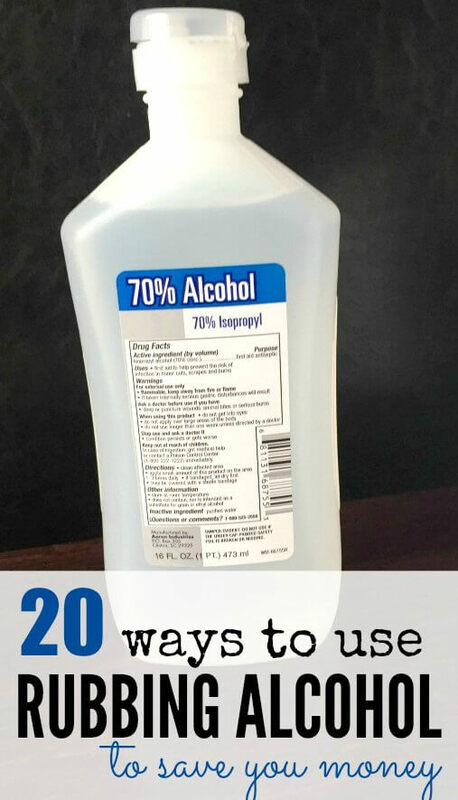 Find out the top 20 uses for rubbing alcohol. Do you reach for the rubbing alcohol when you have a sticker that won’t come off? Well, there are so many more rubbing alcohol uses than just one! Learn all the different ways to use rubbing alcohol. What are your favorite uses for rubbing alcohol? What is rubbing alcohol used for? 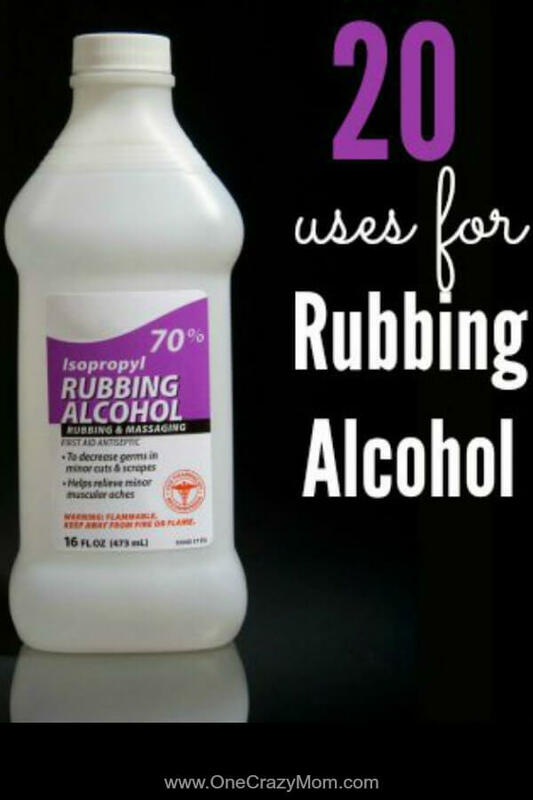 We have 20 Uses for Rubbing Alcohol that you will love! Some of these might surprise you and others you might already know. Did you know using rubbing alcohol to clean is frugal and incredibly effective? There are so many great ways to use rubbing alcohol! It’s great for stainless steel too! Those pesky fingerprints will be a thing of the past! Making a homemade ice pack is quick and easy! Simply add rubbing alcohol and water into a zip top bag and freeze. This will make a nice mold-able ice pack that is much gently on those boo-boos than a baggie full of ice. See detailed instructions on how to make a Homemade Ice Pack here. If your phone has seen cleaner days, wipe it down with rubbing alcohol. Just put some rubbing alcohol on a lint free cloth and wipe away all that dirt and grime. You can use a cotton swab for the hard to reach areas. You might be a bit surprised at how much gunk you’re able to clean off. Have you ever gotten permanent marker on something by accident? Try using rubbing alcohol to remove the stray marks. Just put some rubbing alcohol on a cleaning rag and wipe the area. This works much better if you tackle marker sooner rather than later. We use it to clean our dry erase boards too. If you park outdoors and you know cold weather is rolling in, spray your windshield with a mixture of rubbing alcohol with water (1/4 cup alcohol to 1 cup water). Simply use your mixture to clean your windshield and this will help prevent frost from adhering to your windshield. It’s also a great window cleaner. Just use equal parts part rubbing alcohol to equal parts cups water. This is one of my favorite rubbing alcohol uses! If, like me, you don’t pre-treat your windshield, you are going to love this, too. You’re in a rush to take the kids to school, then you walk outside and notice your windshield is covered in frost. Not cool! You don’t have time to scrape the windshield. Try spraying rubbing alcohol all over the ice on your windshield. Let is sit a minute and when you go to “scrape” it, the frost should just fall right off. In a squirt bottle, combine equal parts water and rubbing alcohol and spray on your bathroom mirrors. Wipe down with newspaper or a lint free cloth. You will have beautiful, streak-free mirrors, even after the shower. If you need more squirt bottles, grab some at Dollar Tree or Amazon. If a pet (or you) happen to have the misfortune of getting up close and personal with a tick, reach for the rubbing alcohol. Dab a little rubbing alcohol on the tick with a cotton ball . It will start backing out of the skin at which point you can easily grab it with tweezers. Yes, we should probably all clean our make up brushes more often. Just soak in rubbing alcohol and let them air dry. You will have nice clean, sanitized brushes. Let’s aim to do this about once a month. I’ll try to remember if you try. 😉 This works better than plain soap and water. Do you have a nice little layer of grease on your stove top? Back splash? Oven hood? One of the very handy rubbing alcohol uses is cutting through grease and grime. Dampen a lint free cloth with rubbing alcohol and rub the grease away. Try making your own air freshener! Use about 1 cup of rubbing alcohol per 10 or so drops of your favorite essential oil. I haven’t tried this yet but I definitely will soon. How unsightly is this? If you have issues with ring around the collar, try rubbing your neck with some rubbing alcohol before you get dressed in the morning. To remove ring around the collar from your shirts, dampen a cloth with rubbing alcohol and rub the collar. You should see the “ring” lift. Get rid of water spots in your stainless steel sink with a little rubbing alcohol. After you’ve cleaned your sink, pour some rubbing alcohol on a cloth and rub it all over your sink. You will see your water spots “evaporate”. You can also try this on your stainless steel fridge – this works a charm on lifting those pesky fingerprints. Do your kiddos (or your significant other) have shoes with a less than desirable smell? Kill the bacteria and freshen them up with a little rubbing alcohol. Take your spray bottle full of alcohol and spray the inside of the shoes. Leave them outside in a sunny location and let them dry. You’ll have clean fresh shoes (or at least fresher then before). If you just finished cutting up some onions (or garlic) and you want to get rid of that ever so potent smell on your hands, just rub on some rubbing alcohol. This will get rid of that smell quickly. Be careful that you don’t have any open wounds. 😉 Hand sanitizer would also work for this. If you have tweezers or scissors in your bathroom, it is important to remember to sterilize them every now and then. Simply wipe down with some rubbing alcohol and let dry. That is it and now your bathroom tools and good and sterilized. Alcohol to disinfect is a great use for rubbing alcohol. I always keep this in the medicine cabinet. Not only can you sterilize the backs of earrings, but you can also clean other jewelry items. Soak your jewelry in rubbing alcohol for a couple of minutes then polish with a lint free cloth. Your jewelry should be clean and shiny. If your tile floor is riddled with scuff marks, get them off with a bit of rubbing alcohol. Just dip a paper towel in some rubbing alcohol and then rub those scuff marks away. Its so easy, you’ll be wondering why you’ve been staring at the same scuff marks for so long. 20. Can you use rubbing alcohol to clean your ears? Yes! Rubbing alcohol is a great way to prevent Swimmers Ear. If you spend a lot of time in the water during the warmer months, you know swimmer’s ear is the worst! Try preventing this painful problem with rubbing alcohol. Just place a few drops of rubbing alcohol in each ear after swimming. The alcohol will dry up an water lingering in your ears. Make sure you don’t do this on anyone with an ear infection or ear tubes (it will NOT feel good). There you have it, 20 common (or maybe not so common) rubbing alcohol uses that will truly help you save money. What have you tried that you liked (or didn’t like)? You might also want to know if you can you use rubbing alcohol on dogs? Yes! If your pet has a tick, rubbing alcohol is perfect to use. Let us know your favorite uses of rubbing alcohol! I love using it to remove permanent marker. Nail polish remover is also another great use. You can also use rubbing alcohol and aloe vera gel to make hand sanitizer. Did you know you can also use rubbing alcohol to get rid of fruit flies? Works like a charm! DIY Shoe Deodorizer Spray – Stinky Shoe Spray! Excellent tips.I’m going to try this my car windows. Thanks. I use 90% rubbing alcohol straight from the bottle on paper towels to clean the bathroom mirror, then sanitize the toilet handle, seat top to bottom, rim and outside. It’s cheaper than containers of ‘wipes’.